1. 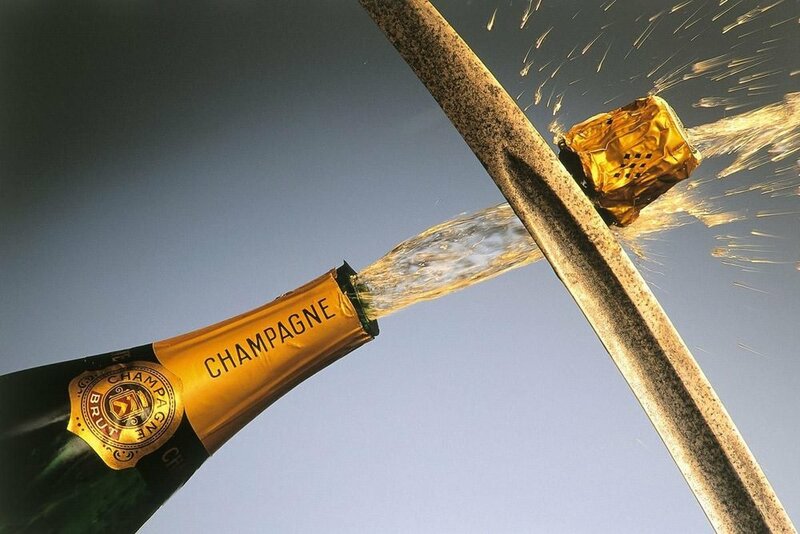 Make sure you are using real, actual Champagne, or sparkling wine made in the Champagne Method / 'Method Champenoise'. Champagnes and wines made using the Champagne Method have the highest pressure of all sparkling wines - 90 pounds per square inch. (Car tires have 32 pounds of pressure per square inch.) Cava is a good choice as well. Prosecco generally is not, given that bottles are under less pressure. 2. Chill said Champagne. The neck most importantly needs to be cold, which will result in more brittle, delicate glass. Don't just throw the bottle in an ice bucket and hope for the best. Get the temp as low as you can to maximize the chances of a clean break. 3. You don't actually need a saber, although sabers are awesome. You can use any blunt object, including butcher and butter knives. I have even heard of wine glasses being used, but that sounds like real skill. So get a blunt object that you can slide along the bottle without feeling awkward. 4. Remove the wrapping and cage so that only the cork is left. Be careful here. Since bottles are under so much pressure, they can burst open just by doing this. 5. Grasp the bottle with your non-dominant hand, with your thumb in the punt. Angle the bottle away from yourself and the crowd (which you'll definitely have) between 30 and 45 degrees. 6. Take a few practice turns by gently running the blunt side of your saber along the seam of the bottle toward the lip several times, in order to get a feel of the shape of the bottle and the path you expect your saber to take. Be gentle until you are ready to take the money shot and open the bottle. 7. Using one good, measured, smooth, and confident thrust, move the blunt edge of the saber along the seam and strike the crevice where the lip meets the bottle neck. 8. FOLLOW THROUGH. Don't jerk your hand back once you feel or hear the bottle break. Follow all the way through as you would with a golf swing. Stay calm and confident and keep the saber going in the same direction as the cork (which should now be hurtling through the air). 9. Silently or not so silently congratulate yourself on a job well done. 10. If done properly, there should not be much breakage, but check for glass shards before pouring. Cheers, you did it. You are the classiest, most skilled person of all time. Happy New Year from Winelala!